The team from Wheelersburg High School emerged as champions during the Scioto County District Mock Trial Competition on Jan. 18. They will now advance to the regional competition on Feb. 15, joined by the runner-up team from Valley High School (team Cody) and advancing team from Portsmouth West High School. “The team was an interesting mix this year. We had two seniors who have been with the program as long as I have; my first year coaching the team was four years ago when they were freshmen. Outside of the two of them, it’s a very young team. The core of five or six other team members were all freshmen. They came in really motivated and really excited,” said Wheelersburg Coach Evan Wills. Regional winners will compete in the state competition on March 7-9 in Columbus. 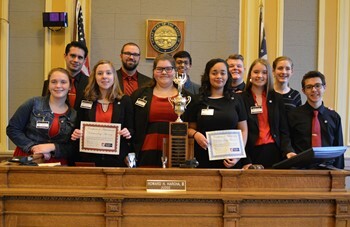 The 2019 State Champion team will represent Ohio at the National High School Mock Trial Championship in Athens, Georgia from May 16 through 18. More than 3,000 high school students across the state participated in the Ohio Center for Law-Related Education’s (OCLRE) 36th Annual Ohio Mock Trial Competition. The Scioto County District Competition is coordinated by the South Central Ohio Educational Service Center’s Gifted Coordinator, Sharee Price, along with Judge Howard H. Harcha, III. The District Competition included 11 teams from eight schools -- including Ironton, St. Joseph, Notre Dame, Portsmouth, Portsmouth West, River Valley Bidwell, South Webster, Valley, and Wheelersburg. The champion Wheelersburg High School team included Legal Advisor Eric Kephas, Alexander Thomas, Ashley Smith, Tanner Preston, Audriana Griffiths, Mahahla Petitto, McKenzie England, Rachel Davenport, Sidney Warnock, Dev Patel, Meena Kirkendall and Coach Evan Wills. The runner-up Valley High School team (Cody) included Legal Advisor Adrienne Buckler, Landon McBee, Corey Basham, Kaitlyn Stone, Karsyn Conaway, Grace Brown, Alexa Billiter, Kolton Bauer, Jacob Greathouse and Coach Dan Kauffman. The advancing team from Portsmouth West High School included Legal Advisor Jay Willis, Taran Willis, Whitney Campbell, Gabe Kouns, Evan Green, Alexa Leist, John Hones, Cianna Newman, Anna Lovins, Haylie Caldwell and Coach Sarah Johnson. Wills said this was his first victory for Wheelersburg. “I think Mock Trial is the most valuable extra-curricular academic experience a kid can have. I’m proud of the kids on my team who worked and prepared, but you could tell both teams we faced in the competition were highly prepared,” Wills said. Outstanding Attorneys awards were presented to Kathryn Davis, Maria Benitez, Landon McBee, Isabella Moore, Alex Holltzapfe, Taran Willis, Rachel Davenport, Evan Green, Ethan Bloomfield, Alex Morris and Corey Basham. Outstanding Witnesses awards were presented to John Jones, Audriana Griffiths, Caleb McKnight, Audrey Litteral, Megan Turner, Landon McBee, Simon Harting, Ian Eblin, Cole Franklin, Anthony Salzbrun and Grace Brown. The Scioto County District Competition is sponsored by American Legion James Dickey Post 23, Velma Feagans, the Honorable Howard H. Harcha, III, Portsmouth Bar Association, Portsmouth Rotary Club, the Scioto Foundation, and Southern Ohio Medical Center.